In April 2016, the Dubai Government revealed its vision for smart transportation. In a series of tweets, His Highness Sheikh Mohammed Bin Rashid Al Maktoum, Vice President and Prime Minister of the UAE and Ruler of Dubai, revealed how smart, driverless vehicles would one day dominate the city’s roads. By 2030, 25 percent of all road trips will be smart and driverless as part of Dubai’s strategy to become the smartest city in the world, and in line with UAE’s long-term objective to achieve a sustainable and diversified economy, he says. Sheikh Mohammed’s announcement, which followed the city’s first trials of a 10-seater driverless bus on pre-programmed routes around Dubai, outlined how a smart transportation strategy would improve efficiency and reduce congestion and pollution. “It will save people millions of hours wasted during travel and increase the productivity of individuals,” he says. When fully implemented, the strategy, a joint venture between Dubai’s Roads and Transport Authority (RTA) and the Dubai Future Foundation, will reduce transportation costs by an estimated 44 percent or US$245 million and improve transport sector efficiency by 20 percent, saving $4.9 billion. “It will be the first project of the foundation to build a model of a futurist city,” says Sheikh Mohammed. Since the smart transportation strategy announcement, several pioneering initiatives have been unveiled. Just last month (February), the RTA revealed that by July this year, the world’s first driverless flying cars could take to Dubai’s skies. The authority, in collaboration with China’s EHANG Company, has conducted the first test-run of an autonomous aerial vehicle (AAV) capable of carrying a human. In a statement, the RTA says the driverless flying car, named EHANG184, could ‘take off’ as early as July. The vehicle is fitted with a touchscreen to the front of the passenger seat, which displays a map of destinations, denoted by dots. It has preset routes from which the rider chooses a destination. The vehicle then starts automatically, takes off and cruises to the set destination before descending and landing in a specific location. A ground control centre will monitor and control the entire operation, the RTA says. The AAV is designed to fly for up to 30 minutes, at a maximum cruising speed of 160km/h, and at a maximum cruising height of 3,000 feet. It is designed to operate under all climatic conditions apart from thunderstorms. Back on the ground and the RTA has also signed a deal with US-based Tesla to buy 200 electric vehicles fitted with autonomous driving technology. These new cars will be added to the limousine fleet of the Dubai Taxi Corporation (DTC). The deal was inked on the sidelines of February’s World Government Summit 2017 in Dubai by RTA director general and chairman Mattar Al Tayer and Tesla Inc. chairman and CEO Elon Musk. Tesla has opened an office in Dubai to facilitate the distribution and maintenance of its vehicles. The RTA will purchase all-electric Model S sedans and Model X SUVs, which are equipped with the hardware needed for full self-driving capability at a safety level "greater than that of a human driver", says Tesla. Meanwhile, trial runs of the 10-seater autonomous buses have been conducted in several prominent areas of Dubai including Business Bay, Dubai World Trade Centre and Mohammed bin Rashid Boulevard in Downtown Dubai. The shuttle bus was most recently trialed on a 600-metre-long track in Business Bay with the service extended due to popular demand from residents and visitors wanting to try this new mode of transport. Smart transportation strategies are also being considered for city-to-city journeys, with studies underway into the feasibility of a Hyperloop rapid transport system between Dubai and Abu Dhabi. The RTA has signed a deal with US-based research firm Hyperloop One, which will see the two entities collaborate to make the ground-breaking project viable. Under the deal terms, Hyperloop One will work with McKinsey and architecture and engineering firm the Bjarke Ingels Group (BIG) on a detailed feasibility study. 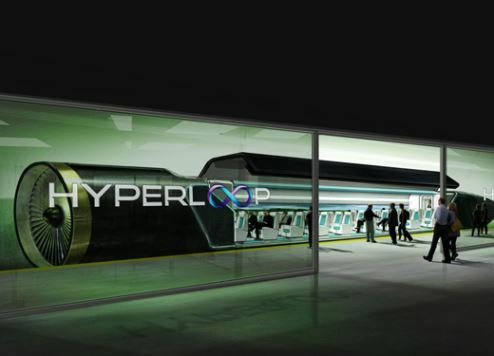 Hyperloop is another Elon Musk venture. The futuristic mode of transport involves using magnets to levitate pods inside an airless tube, creating conditions in which the floating pods shuttle people and cargo at speeds of up to 500 miles per hour. Hyperloop One, which is one firm researching how to build such a system, claims that it would transport passengers and cargo from Dubai to Abu Dhabi in as little as 12 minutes. Over the past three months, various studies have been conducted with a view to building the business case for a Dubai-Abu Dhabi Hyperloop. “Following the completion of the provisional feasibility study, Hyperloop One will submit final reports for assessment of deliverables by RTA experts, and recommendations will be raised to the steering committee to assess the feasibility of implementing the Hyperloop technology,” says Al Tayer. Hyperloop One plans to conduct the world’s first full-size Hyperloop test in Las Vegas this year in a bid to prove the company has the technology in place to carry passengers from A to B at close to the speed of sound. For Dubai, the RTA envisages the Hyperloop system as a key facet of its emirate-wide smart transportation strategy.